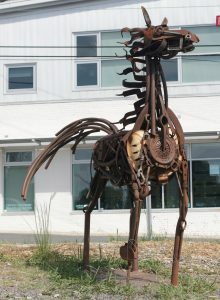 A bronze-colored, five-foot horse statue made from scrap metal pieces sits at the intersection of Rigsbee Avenue and Hunt Street in Northeast Central Durham. Further down Hunt Street is a sculpture with a scarlet silhouette of three people peddling on unicycles. Placed near the side building backdrop of two men forging metal is another metal statue of a rooster standing on the extended arm of a woman. These few visual aspects only tell a mere fraction of what goes on at Vega Metals Inc.
“It’s like taking something from the past and putting it into the modern-day world and trying to make a living out of it,” Neal Carlton said one Thursday afternoon. 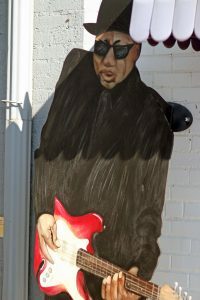 The former tobacco barn turned creative-friendly art gallery opened its doors in 1987 by way of a reconnected high school friendship between Francis Vega and Neal Carlton in 1981. The two blacksmiths designed architectural metalwork furnishings over the years, going on to be recognized in numerous trade publications and winning international awards. Vega Metal Inc.’s best seller and signature metal design, the butterfly bench has continued to sell year-round to warmer climate states and can also be seen at Duke Children’s hospital. Carlton said only a “knowledge in blacksmithing” can figure out how to exactly remake its uniquely attractive carvings. After the loss of Francis Vega in 2013, his wife Cindy Vega along with Neal Carlton (co-owners) have been on the receiving end of an increasingly supportive community and many passionate ideas. A few of those ideas can be traced to 1999, from a persistent self-taught jewelry maker who wanted to run a gallery – little did Carlton and Vega know how much that person, Cecilia Henaine De Davis, would expand the business. Cecilia Henaine De Davis is the coordinator of the art market that she helped put together with Vega before he passed. Held every Saturday from 7:30 am to around noon, artists, vendors, and live performers gather on a sectioned off Hunt Street to showcase sundry homemade items. Whether it’s crochet knit bunnies, pocketbooks, talking sticks, specialty tea, or birdhouses, the art market has served as an immediate platform for those looking to just make something and share exploratory creations. “You have to find a way. And that’s how I was always telling them. Find a way to do something that distracts you, and create something that will help you to be able to survive at the moment,” Davis said. Davis credited her improved English and communication to the transcending moment five years ago where she worked with a women’s group of incoming domestic violence survivors. The half Mexican and Lebanese avant-garde worked on an aluminum necklace as she described her time at Casa De Esperanza, a Latina-oriented shelter in Minnesota. As the vast differences in culture shifted within the shelter Davis organized jewelry making workshop sessions for women to have an outlet to cope with emotional distress. “I need to do something. I need to deliver the information to the Latinas, all people for them to be able to survive,” Davis recalled. 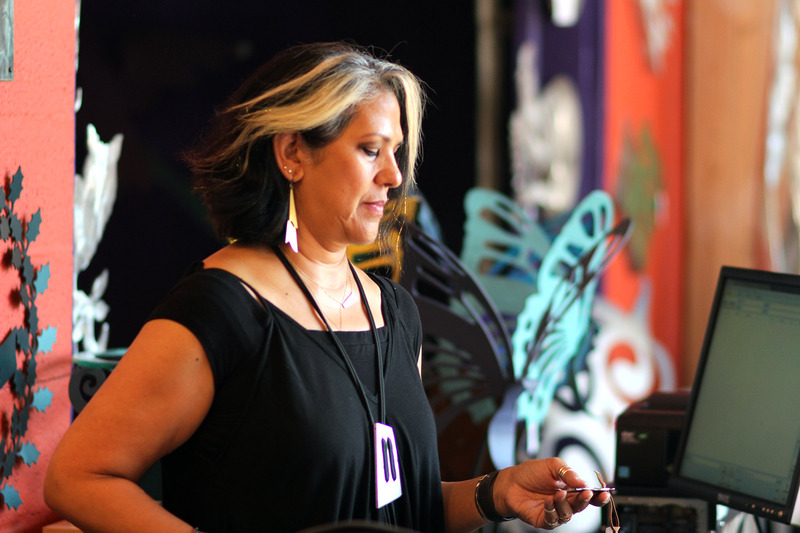 Davis relocated to Durham with her husband in 1999, saw the lack of shelters and began work at a long since then closed Latina shelter in Carrboro. “I was so hungry for family, my status wasn’t finalized, and my mother-in-law and all his family was here,” Davis said. Now at 214 Hunt Street, her role as a jewelry maker has grown to ultimately give Durham residents a space to be and see productive citizens. 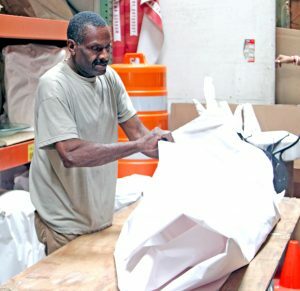 “If not for Mrs. Cindy and Cecilia there would be nothing to do,” said Lenny Green, who has been performing at the art market for seven years. Green, also known as “Mojo Hand” continues to show his allegiance to Vega Metals Inc.’s art gallery because of the well-received feedback every weekend. “I get so many accolades from the people thanking me for the music I choose but to see people dance, clap their hands and stomp their feet is the line at infinity for me,” Green said. Autavius Smith of Charlotte, N.C., is a senior journalism and broadcast major at NCCU serving this fall as a writer-photographer with the VOICE. Good to find out that they can also craft different things aside from jewelry. They looked all good and for sure, this will bring the interest of the people in a different kind of art as well. Great article. I enjoy every Saturday on Hunt Street.